Three short stories in the horror genre: the first about a serial killer, the second about a hair transplant gone wrong, and the third about a baseball player. There are some features that seem to get lost in the shuffle over time, no matter how good they are. Which is what brings me to this film. Imagine an anthology film being released with stories from Horror icons John Carpenter and Tobe Hooper, now throw in some amazing casting with the likes of Mark Hamill, Robert Carradine, David Naughton, Debbie Harry, Peter Jason, Charles Napier and more. Tell me that you wouldn't be excited for that, well what if I told you it's actually real. Despite the film turning 26 this year it amazes me how many people have no idea it actually exists! Is it because it was a TV movie? There have been plenty of other Horror TV Movies that became big, so why not this one? Like I said before, sadly sometimes films get lost in the shuffle. As I said the film was released on TV but the feature was actually made as a pilot episode for a proposed anthology series to air on Showtime, but for some reason Showtime pulled the plug. Shame really as I really love anthogy films and shows and it could've kick started something great. The film features a very EC Comic tones, kind of like "Creepshow", but you can see Carpenter and Hooper's stamp all over their stories and it seems like everyone involved had such fun time. Also be sure to keep an eye out for some very fun cameos that every Horror fan will love to point out, I know I did. "Body Bags" is a film I feel deserves more recognition, it's just so entertaining that it leaves you grinning from one ear to the other. If you are one of the people who haven't seen it then I urge you to make sure you do, I'm sure you won't regret it. In "The Gas Station", as Bill is watching TV, the anchorman mentions a body was found in Haddonfield, a reference to John Carpenter's earlier film, Halloween (1978). This film features many great horror directors that act and/or direct. John Carpenter director of Halloween (1978) plays "The Coroner" and introduces each segment as well as directs two of the stories, "The Gas Station" and "Hair", Tobe Hooper director of The Texas Chainsaw Massacre (1974) plays "Morgue Worker # 2" and directs the last segment, "The Eye", Wes Craven director of A Nightmare on Elm Street (1984) plays "Pasty-Faced Man" at the gas station, Sam Raimi director of The Evil Dead (1981) plays "Dead Bill", and Roger Corman plays Dr. Bregman in the segment "Eye". 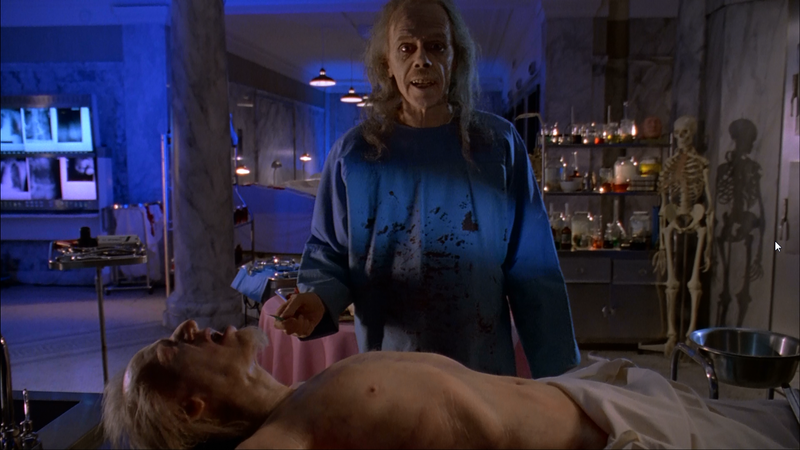 John Carpenter spent three hours in the make-up chair for his role as The Coroner. Clive Barker was asked to play a role, but had to decline because he was busy at the time. The scene where Stacy Keach unwraps his long hair in front of the mirror was done in a single take. The buxom woman in the morgue was provided by Ron Jeremy. The segment "The Gas Station" was shot completely at night. Peter Jason drove his own car in the segment "The Gas Station." The last story in The movie "Body Bags" is entitled "Eye," and the story has a particularly strange personal connection to both lead actors Mark Hamill and Lesley Lawson (better known as the model "Twiggy"). 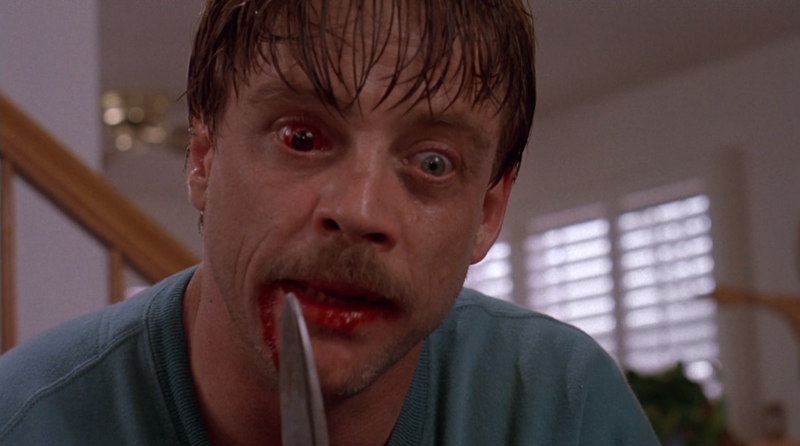 In "Eye" Mark Hamill is a minor league baseball player who crashes his car and loses his right eye, and Lawson plays his wife. In 1977, Hamill crashed his car in real life and required seven hours of reconstructive surgery to his face, leaving his appearance noticeably changed in the movie "Return of the Jedi." Lesley Lawson's first husband In real life was actor Michael Whitney. Before he started his acting career Whitney played for the Hornell Dodgers and the Great Falls Electrics, both minor league baseball teams. David Naughton has a cameo in the first story of "Body Bags" titled " The Gas Station." He is part probably most famous for his lead role in "American Werewolf in London." The keyboard music playing as Naughton gets up in the garage sounds strangely similar to Ennio Morricone's song " Animals and Encounters" which was featured in the movie " Wolf," which starred Jack Nicholson and Michelle Pheifer as werewolves, and which came out at around the same time as "Body Bags."